The most recent graduates of the Hard Rock Miner Common Core program received their diplomas on June 14. Credit: Northern College. WAWA, Ont. 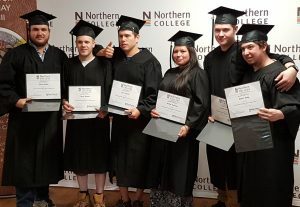 – Northern College was pleased to celebrate with students who graduated from the Underground Hard Rock Miner Common Core program on June 14 at the Royal Canadian Legion in Wawa. Six students completed the 15-week training program, offered in partnership with Richmont Mines. Graduates included indigenous students from the communities of Missanabie Cree and Pic Mobert First Nations. The modular training program was delivered at Richmont’s Island Gold mine in Dubreuilville, with curriculum and instructors provided by Northern College. The program also included first-hand experience gained by embedding students into underground crews and following production schedules. The skills acquired through this program will provide the participants with increased employment opportunities in the mining sector. Successful graduates are now prepared with the knowledge and skills to work effectively and safely in the mining industry as a hard rock miner. Topics covered in the modular training program included staging, rock bolting, scaling, lock and tagging, blasting, mucking, and drilling. Representatives from Richmont, Missanabie Cree First Nation and Northern College attended the ceremony. For more information about the Underground Hard Rock Miner Common Core program, contact Northern Training Division, by phone at 705-235- 3211 ext. 2174, or by email at hardrockminer@northern.on.ca.